The blood hadn’t even dried on heavyweight champion Cain Velasquez’s face yet, and it certainly didn’t stop gushing from Junior dos Santos’ mug on Saturday night, but that didn’t stop UFC president Dana White from tentatively setting up Velasquez’s next title defense. 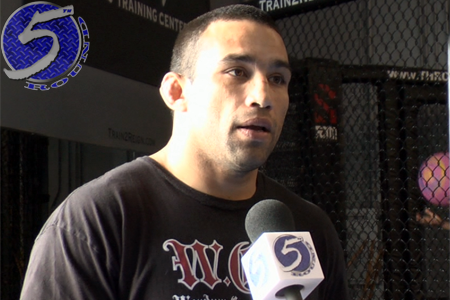 After Velasquez posted his second landslide victory over dos Santos in 10 months to take the lead in their trilogy, White suggested the most formidable opponent for Velasquez is Fabricio Werdum (pictured). “We do Werdum. Werdum is probably next,” White stated after Saturday’s pay-per-view broadcast. Some might argue Werdum won’t stand a chance, but those same naysayers said the exact same thing before he served up an upset special over Fedor Emelianenko in 2010. In addition, it’s clear Velasquez is the best of the best in the division, and dos Santos is the best of the rest, but the UFC can’t do a fourth tango between the two – at least for a while, if ever. Werdum is the next best option. He has quietly won six of his past seven scraps, including three straight. “Vai Cavalo’s” most recent win came in June’s submission victory over Antonio Rodrigo Nogueira. Velasquez, meanwhile, joins UFC Hall of Famer Randy Couture, Andrei Arlovski, Tim Sylvia and Brock Lesnar as the Octagon’s only heavyweight champions to defend the throne two times in a row after Saturday’s victory over dos Santos. He owns a 13-1 professional record and has now avenged his lone blemish twice in convincing fashion. White didn’t confirm when Velasquez and Werdum would collide.